Olympic Holidays, the UK’s leading European Island Holiday company, has unveiled its dedicated Weddings, Honeymoons & Renewal of Vows brochure with a host of new, inspiring venues and destinations. 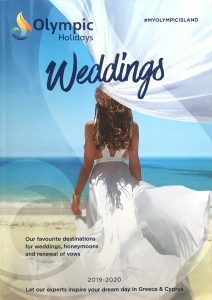 As a pioneer in arranging romantic weddings in Greece and Cyprus, plus 50 years’ experience in booking holidays to idyllic destinations, Olympic Holidays is the go-to travel company for guests who require a bespoke service from a lavish event with guests who are travelling in from across the globe to more intimate, boutique occasions. Do you know what the average cost of a wedding was in 2017? With the average cost of a UK wedding rising to £27K in 2017, the choices curated by the company’s dedicated weddings team combine not only the big day and honeymoon but deliver luxury memories at a fraction of the cost. Weddings in Greece start from £299 which includes assistance throughout, with guidance on legal paperwork, along with dedicated co-ordinators in the UK & on the ground. Weddings in Cyprus start from £369 for Olympics’ Basic Package which includes dedicated co-ordinators in the UK & on the ground, wedding license, marriage certificate and transfers to and from the Town Hall. Silver Wedding Packages start from £639 and includes extras such as photos & an album, Posy Roses, Buttonhole, Bottle of Sparkling Wine & Basket of Petals and their Gold Wedding Package starts from £889 and includes a greater number of photos, flowers, Bridal Hair & Make Up. Tailor-made packages are also available if you’re looking for something completely bespoke. (Extras that will need to be paid in resort include venue fee, officiating officer fee and any decoration choices). From a beachside or chapel ceremony, town hall or beautiful hotel garden, the weddings team has years of experience in start-to-finish planning and advice and, taking the time to get to know each couple. The 2019 brochure features five new Olympic Gold wedding venues, adding to a collection of more than 70 locations. Basic and Silver packages in Cyprus have been updated and offer convenience and value for different budget levels, and a dedicated team to ensure each couple’s team becomes a reality. Olympic Holidays (www.olympicholidays.com) offer 7 nights at Olympic Lagoon Resort, Ayia Napa from £1,136pp staying in a Deluxe Room Inland View on an all-inclusive basis. Price includes flights, accommodation & transfers, based on June 2019 departure. Olympic Holidays (www.olympicholidays.com) offer 7 nights at Ikos Dassia, Corfu from £1,489pp staying in a Promo Room Insland View on an ultra-all-inclusive basis. Price includes flights, accommodation & transfers, based on June 2019 departure.